Lithium is used for the treatment of bipolar disorders; however, as lithium is renally excreted, it accumulates, with loss of renal function. We describe a patient with bipolar disorder, a long history of lithium use, and chronic kidney disease (CKD) who developed lithium intoxication following an intentional overdose with multiple drugs. The patient was taken by ambulance to the hospital emergency department and arrived there approximately 4 h after assumed ingestion. When toxicology screening was performed, the patient was found to have a lithium concentration of 2.7 mmol/L. Continuous venovenous hemofiltration (CVVH) was started, but lithium concentrations continued to rise. Intermittent hemodialysis (iHD) was therefore introduced and continued until lithium concentrations dropped below 2.0 mmol/L. Lithium intoxication was not the initial focus of treatment, but, in retrospect, was the primary cause for admission. This case report shows that CVVH is an insufficient technique to remove lithium as concentrations continued to increase during its use. iHD should be used instead of CVVH and, especially in CKD patients, should be introduced immediately when lithium concentrations are > 2.5 mmol/L. Lithium is frequently prescribed for the treatment and prophylaxis of bipolar disorder and manic periods. It is a small compound (7 Da) with a volume of distribution of 0.69–0.70 L/kg. Despite its rapid absorption, diffusion of lithium to the brain and cerebrospinal fluid takes approximately 24 h [1, 2]. Extended-release (ER) formulations of lithium carbonate are most frequently prescribed in dosages of 400–1200 mg/day. Lithium is excreted through glomerular filtration and 70–80% of this amount is reabsorbed in the proximal tubulus and loop of Henle. Overall, the majority of the administered dose (90–95%) is excreted by the kidneys. As a result, lithium accumulates with a loss of renal function [1, 2]. Therefore, in patients with decreased renal function or chronic kidney disease (CKD), lithium concentrations increase, causing adverse effects or even toxicity as lithium can no longer be cleared from the body. However, whether lithium also causes renal toxicity itself is still under debate . Therapeutic concentrations of lithium range from 0.4 to 1.2 mmol/L depending on the population and indication . Acute lithium toxicity is reported in patients with plasma concentrations of > 1.5 mmol/L , whereas chronic toxicity can also occur with concentrations of < 1.5 mmol/L. Intoxication with lithium predominantly affects the central nervous system (CNS). Symptoms of mild toxicity include drowsiness, nausea, vomiting, tremor, hyperreflexia, agitation, muscle weakness, and ataxia. In more severe cases, coma, convulsions, myoclonus, bradycardia, hypotension, arrhythmia, and ventricular and atrial fibrillation have been reported . In this case report, we describe a patient with CKD and lithium intoxication, in whom lithium concentrations increased despite receiving extracorporeal treatment. The patient was taking lithium chronically for bipolar disorder but, due to an intentional overdose of lithium (acute-on-chronic intoxication), lithium intoxication occurred. Informed consent for this case report was obtained from the patient. A 39-year-old female (1.67 m, 88 kg) was found after an intentional overdose. The patient was taken to the hospital by ambulance and presented, presumably, 4 h after drug intake. Based on empty medication blisters, it was suspected that the patient took the following drugs: temazepam 300 mg, olanzapine 200 mg, valproic acid 19 g, amiloride 450 mg, and colecalciferol 8000 IU. The patient was also receiving treatment with lactulose, atorvastatin, levothyroxine, venlafaxine, budesonide, and calcium supplements. According to her medical history, the patient had been taking lithium since 1996 to treat bipolar disorder. Lithium treatment was discontinued in 2009 because of the development of CKD, triggered by a decade of lithium use. Despite CKD, from 2011 to 2018, the patient was periodically on and off lithium therapy due to worsening of her bipolar disorder or CKD, respectively. During these years, the patient was treated by both a psychiatrist and a nephrologist. At presentation at the hospital emergency department, we assumed that the patient was no longer taking lithium, and did not have lithium at her disposal. In the emergency department, the patient had Glasgow Coma Scale eye, motor, and verbal scores of 1, 4, and 2, respectively. She was tachypnoeic, had tachycardia (106 beats/min) and a blood pressure reading of 141/87 mmHg, and was disorientated. Her estimated glomerular filtration rate (eGFR; calculated using the Modification of Diet in Renal Disease [MDRD] formula) was 31 mL/min. Symptomatic treatment with 500 mL of 0.9% sodium chloride was started, and urine tests for drugs of abuse and toxicology plasma screens were performed. Plasma concentrations of valproic acid, olanzapine, and lithium were quantitatively measured (Table 1). When the results came back from the laboratory, surprisingly the plasma lithium concentration was 2.7 mmol/L (Table 1). However, this was consistent with the medical history as given by her partner, who arrived later, as empty blisters for 45 ER tablets of lithium 400 mg were found. 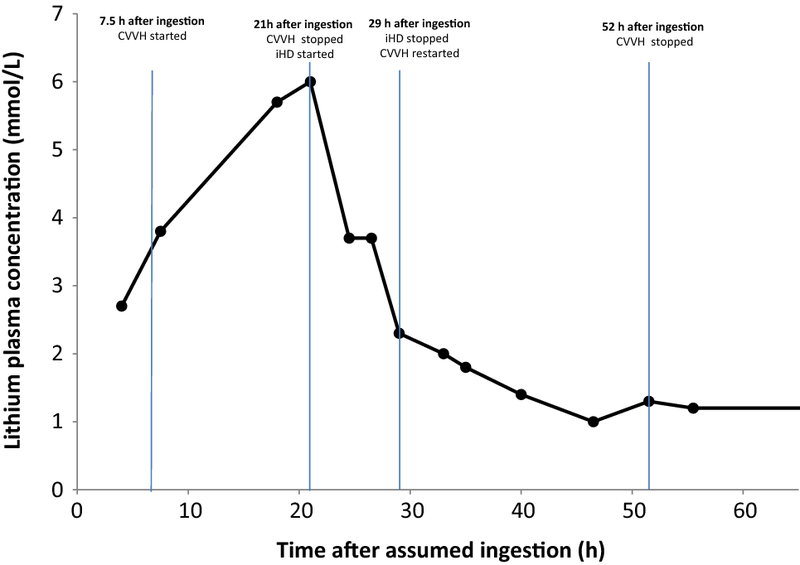 Meanwhile, the patient was transferred to the intensive care unit (ICU), where continuous venovenous hemofiltration (CVVH) was started 7.5 h after assumed ingestion, with lithium intoxication expected to be ‘mild’ in combination with neurological symptoms. During the night, the patient had severe diarrhea and therefore total bowel irrigation was not considered. Despite the use of CVVH, lithium concentrations continued to increase (Fig. 1, Table 1). Therefore, intermittent hemodialysis (iHD) was started 21 h after assumed ingestion, and was continued until a lithium concentration of 2.0 mmol/L was achieved, which required 8 h of iHD. CVVH was then started again and continued for approximately 24 h (Fig. 1). The neurological symptoms of lithium toxicity disappeared with implementation of iHD. The patient was discharged from the ICU after 6 days, once we were sure that rebound toxicity would not occur, and stayed in a hospital ward for an additional 5 days. In this case report, we describe a patient with bipolar disorder, a long history of lithium use, and CKD who developed lithium intoxication. Despite extracorporeal treatment, lithium concentrations increased during hospital admission. At presentation, the patient’s neurological symptoms were thought to be primarily caused due to intoxication with valproic acid and olanzapine as the patient had ingested large amounts of these drugs. The main risk of valproic acid intoxication is CNS depression, which is treated mostly symptomatically. Because of the co-ingestion of temazepam, the risk of convulsions in our patient was low. We did not find substantial concentrations of olanzapine (Table 1). Another of the co-ingested drugs, amiloride (a potassium-sparing agent), is among the diuretic agents that do not influence lithium plasma concentrations. Therefore, this was not the cause of the high lithium concentrations measured in our patient. The lithium concentration did not decrease during CVVH therapy (Fig. 1). According to the Dutch guidelines, to remove lithium, iHD is recommended over CVVH in patients with CKD and lithium concentrations of 2.5–4.0 mmol/L . Despite this recommendation, we did not introduce iHD immediately; CVVH was started based on her neurological condition. Because of this, we do not believe that the patient was mistreated. Based on the neurological symptoms of the patient and the recollections of the patient’s partner, the lithium intoxication was classified as an acute poisoning, in which the distribution of lithium to the extracellular compartments is limited. Therefore, the increase in lithium concentrations during treatment with CVVH was unexpected, and more fits an acute-on-chronic lithium intoxication. The rise of lithium concentrations is most likely explained by increased lithium absorption. Intoxication with lithium can delay the time to maximum plasma concentrations by up to 72 h , especially when ER tablets are ingested, as they were by our patient. However, the role of delayed absorption is uncertain as the patient suffered from diarrhea during the night. The diarrhea could have been caused by the lithium intoxication itself or by the concomitant use of medications such as lactulose. Diarrhea could also cause dehydration, resulting in decreased renal function and increasing lithium concentrations. Nevertheless, we believe this had a minor impact on lithium concentrations as the patient was hydrated during their stay at the ICU. Secondly, a lithium rebound effect could have caused increased lithium concentrations. Redistribution is more likely to occur using high-efficiency techniques such iHD, than with CVVH, as iDH is approximately threefold more efficient in clearing lithium than CVVH (106.9 vs. 43.1 mL/min) . This is also the reason why iHD should be started in patients with CKD and lithium plasma concentration > 2.5 mmol/L. These two processes—absorption and redistribution of lithium—were probably occurring simultaneously, resulting in the increment of lithium concentrations during CVVH. When CVVH was switched to iHD, lithium concentrations dropped quickly, showing the difference in clearance of these extracorporeal treatments. Be aware of the possibility of lithium intoxication in patients with bipolar disorder. Intoxication can be very harmful, but can be easily detected using the standard laboratory toxicology packages. Be aware that iHD is the most effective technique in removing lithium in patients with CKD and lithium intoxication. Introduce iHD quickly when lithium concentrations are > 2.5 mmol/L, especially in patients with CKD as their own clearance is insufficient. Elise J. Smolders declares having received travels grants from Abbvie and Gilead; however, these conflicts of interest did not influence the preparation of this case report. Pleun S. van Egmond, Joan Doornebal, Harry Naber, Peter G. J. ter Horst, and Sabine H.A. Diepeveen declare no conflicts of interest directly relevant to the content of this case report. No funding was used in the preparation of this case report. Dutch Medicines Evaluation Board. Summary of product characteristics: Camcolit 2016 [in Dutch]. https://db.cbg-meb.nl/IB-teksten/h09013.pdf. Accessed 20 Mar 2019. US Food and Drug Administration. Prescribing Information: lithium and lithium carbonate 1970. https://www.accessdata.fda.gov/drugsatfda_docs/label/2016/017812s027,018421s025,018558s021lbl.pdf. Accessed 20 Mar 2019. Dutch society for hospital pharmacists. Toxicology information: lithium 2018 [in Dutch]. http://toxicologie.org/monografie/Lithium. Accessed 20 Mar 2019. Dutch Society for Hospital Pharmacists. 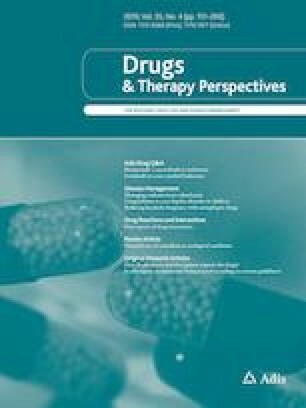 Therapeutic drug monitoring Information: lithium 2018 [in Dutch]. https://tdm-monografie.org/tdm-monografieen. Accessed 20 Mar 2019.